For decades, the KitchenAid Artisan Stand Mixer has been a household staple and culinary icon. It’s empowered throngs of epicureans and created a cult brand. 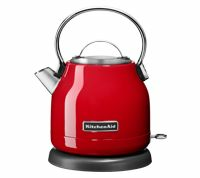 KitchenAid is excited to introduce the Artisan Mini - a new and innovative addition to the KitchenAid Stand Mixer family. With the launch of the new Artisan Mini, there is now a smaller mixer that takes up less counterspace, is lighter in weight so you can easily move it around your kitchen and has the same iconic design and power as our other Tilt-Head stand mixers. Though mini in size, the NEW Mini Stand Mixer can make up to 5 dozen cookies in it’s 3.3 L stainless steel bowl. It is 20% smaller and 25% lighter*, making it the ideal culinary tool for smaller spaces and kitchens. *Compared to full size KitchenAid® tilt-head stand mixers. Allows the user to select the right speed for the mixing job, from a slow stir to a very fast whip. From bold to understated, there’s an Artisan® Mini to match both your kitchen and your style. Colors include Honey Dew, Hot Sauce, Matte Black . The Artisan® Mini Stand Mixer is compatible with all hub-based Stand Mixer Attachments including everything from a spiralizer, pasta maker and food grinder to a food processor and juicer thus offering endless opportunities to take your stand mixer to the next level. With chrome-plated knobs, convenient power cord location, elegant wrap-around trim band. For a range of sweet and savory recipes. From cupcakes, to guacamole, minced meat and more. 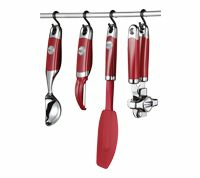 Includes 3.3 L brushed stainless steel bowl, dishwasher safe coated dough hook, coated flat beater and wire whip. 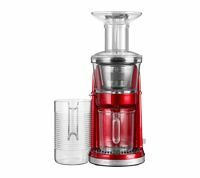 Allows clear access to the bowl and attached beater or accessory so you can easily add ingredients for a recipe.